After checking it out briefly when it first announced, I was prepared to hate the Samsung Galaxy Tab S4. Sporting outdated specs similar to last year’s Galaxy Note 8 (except with 2GB less of RAM and worse cameras), no fingerprint reader, and a price tag of $650 (and that’s not including its $150 keyboard dock), the Tab S4's underlying components just didn’t make sense. And for all that, what was Samsung offering in return? A slightly larger screen with slightly smaller bezels and Samsung’s Dex software instead of Chrome OS? But I wanted to give the Tab S4 a fair shot, so I took it with me on a trip out of town, with the Samsung’s new tablet as my only computer aside from a phone. I even skipped out on bringing a mouse, because while you can easily connect one over Bluetooth or via a USB-C dongle if you really want, if Samsung doesn’t think a mouse is important enough to include in the box, I wasn’t going to give it any extra help. And while I’m still not totally sold on the Tab S4’s total package, by the end of the weekend, I did have a new appreciation for its flexibility. By itself, the Tab S4 comes out of the box looking and functioning like a lot of other Android tablets. It’s got your standard grid of icons, drop down notification shade, and a very familiar and finger-friendly UI. And its solid build is basically a bigger take on Samsung’s most recent Galaxy phones, with a rounded metal band around the outside and glass in front and back. But at the same time, very little has changed from last year’s Tab S3 aside from cutting down its bezels and removing the home button with the built-in fingerprint reader. In its place is Samsung’s Intelligent Scan system which reads your irises and your face to unlock the tablet without you needing to touch a thing, and usually it works just fine. I quickly lost count of how many times I ran into this little annoyance. I even tried to be conscious about moving my thumb out of the way. Except when you’ve got the Tab S4 in laptop mode, with the thing connected to its keyboard dock in landscape orientation. That’s because if you try to tap the Tab S4’s lock button, which is located in the top left corner, your hand naturally covers up the Tab S4’s front-facing sensors. Then all you get is an annoying pop-up asking if your paws are in the way, which of course they are, and the Tab S4’s awkward design is the reason why. After that, I quickly adjusted my habits and shifted to other ways of unlocking the device without my hand getting in the way, but I couldn’t help but feel like l was accommodating the Tab S4, not the other way around. The stylus is a simple, but useful tool, especially if you don’t want to carry around a mouse. Meanwhile, the Tab S4’s included stylus brings with it almost all of the features you get on a Galaxy Note phone, including the ability to jot down notes before even turning on the screen, quickly transform videos into shareable gifs, easily highlight and translate text, and more. It’s a definitely a nice bonus, but the stylus doesn’t really shine until you switch the Tab S4 into Dex mode—Samsung’s custom desktop UI that it uses instead of something like Windows or Chrome OS. That’s when the stylus and the keyboard dock become essential parts of a much more powerful system, which is kind of a problem because only the stylus actually comes bundled with the S4. With the tablet in Dex mode, suddenly the UI transforms into something much closer to what you’d find on a real PC, with app icons on the desktop, a task bar down below, and a cluster of setting and notification control in the bottom right. You still get support for pretty much every single Android app, except now each one lives in a handy window that can be moved around, resized to set to fullscreen as needed. Finding the icon to turn Dex on or off is pretty easy, but then you have to wait around for about five seconds as the Tab S4 switches modes. Some apps like first-party offerings from Samsung and others such as Microsoft’s Office Suite for Android get enhanced to where they function more like their full-fat PC versions. Unfortunately, other apps like games need to be bludgeoned into obedience by Samsung’s Dex Labs framework, which is what allows you to maximise apps in windows, and often requires you to open and close those apps and Dex mode a couple times before they behave properly. For IT departments, Samsung even offers virtualization through Citrix and VMWare to help ensure the Tab S4 can run older and more obscure legacy software as well. It’s a nice touch for potential business owners, but also very niche. Either way, this meant I had no trouble writing emails, editing photos, or knocking out any other tasks I need to do that weekend, with one hand on the keyboard, and the other holding the stylus, which is important, because Dex’s much smaller UI demands much greater precision. Unlike a Surface or a traditional 2-in-1, the angle of the Tab S4's screen is stuck in one position. The Tab S4's smaller footprint makes it easier to use on cramped airplane tray tables, but unlike a Surface or a traditional 2-in-1, in laptop mode there’s no way to adjust the angle of the screen. Thankfully, the Tab S4’s keyboard felt pretty good, with enough key travel and bounce to make typing relatively painless, even with all those of half-size and shrunken keys. That said, I still often found myself wishing the Tab S4’s keyboard cover had a built-in touchpad. I get why Samsung didn’t include one, but for true mobile productivity, as good as that stylus is, it isn’t a true substitute for a mouse. Here is where the Tab S4's stylus should be, if it hadn’t fallen off so easily. In fact, one of my biggest issues with the Tab S4 was also quite humbling, because it was largely my fault. On my plane flight back to New York I lost the Tab S4's stylus. This is the first time in my career I’ve ever misplaced something from a review unit, and it felt awful. However, in my defense, because the little holder used to keep the Tab S4's pen connected to the keyboard dock is secured only by a weak plastic tab, it’s prone to detaching from the system. So when I grabbed it out of the seat back pocket before getting off the plane, the Tab S4's stylus stayed behind. Still, I’m the one to blame, I should have known better, so let my mistake be a lesson. At least now, I get to test how easy it is to buy a replacement stylus. And based on my time with the Tab S4, this probably won’t be the only case of a disappearing Samsung stylus. 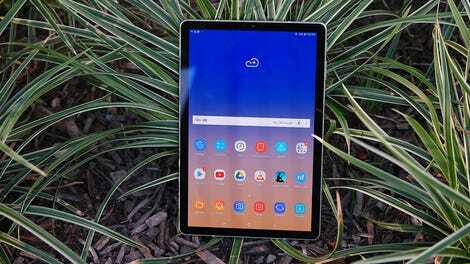 But at the end of the weekend, the Tab S4 had performed surprisingly well, whether it was serving as a way better movie playing machine than a typical airline’s in-flight entertainment system, quickly firing off emails, writing, or just doing a little bit of web browsing. And things like its sharp and colorful 10.5-inch AMOLED screen, quad speakers, and big 7,300 mAh battery made using the Tab S4 over prolonged periods actually pretty nice. And on their own, things like the Tab S4’s awkward front sensor location, lack of a fingerprint sensor, and not quite full-sized keyboard and missing touch weren’t bad enough to completely trash my experience. For such a cramped keyboard, I got used to it pretty quickly. I still think it needs a touchpad though. However, there are still two things I can’t wrap my head around when it comes to the Tab S4: its price and its OS. Combined, the Tab S4 and keyboard cover costs $800, which is $170 more than an equivalent Surface Go (tablet + Surface Cover + Surface Pen), and $300 more than Samsung’s own Chromebook Plus V2, which are just as good, if not significantly better at being mobile productivity machines. Compared to those other two, the Tab S4’s 10 hour and 13 minute battery life is it’s only major advantage, with the Chromebook Plus V2 lasting two and a half hours less at 7:42, while the Surface Go wasn’t much better at 8:05. That’s not an insignificant gap by any means, but the Tab S4’s high price means you’re paying a lot for that extra runtime. In a lot of ways, Samsung made a really faithful Android counterpart to Apple’s iPad Pro. The problem is that because the Tab S4’s lives outside of Apple’s restrictive ecosystem, it has to fend off much tougher and less pricey competition. 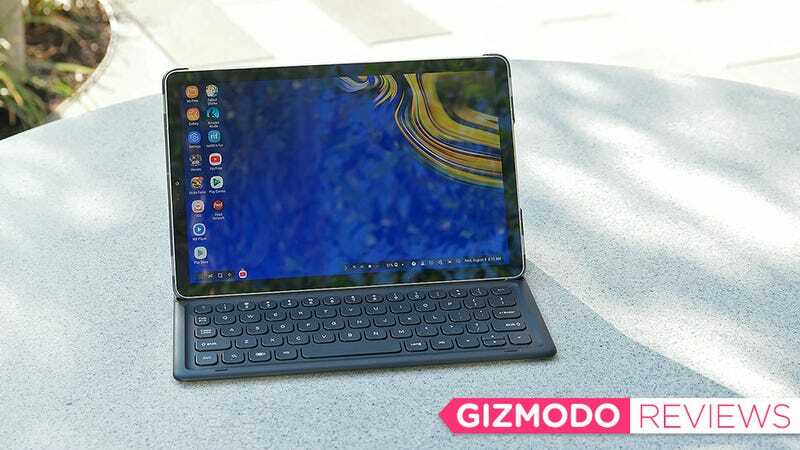 It’s a sort of a tragedy because while the Tab S4 showed me there’s still very much a place for a premium multi-purpose tablets, but when you take price and productivity into consideration, it’s not my first choice for the one I’d buy. Samsung’s Dex mode does make it easier to work on-the-go, but as an alternative to Chrome OS, it’s advantages aren’t quite as obvious. The Galaxy Tab S4 has similar specs as last year’s Galaxy Note 8, but with 2GB less of RAM. It’s annoyingly easy to block the Tab S4’s iris sensor when using the system in laptop mode. The keyboard dock is an optional extra, and it doesn’t have a touchpad, which means you’ll probably want to get a Bluetooth mouse too if you don’t have one already. Thanks to it’s big 7,300 mAh battery, the Tab S4's biggest advantage over its competitors is on battery life. There will be a version of the Galaxy Tab S4 with built-in 4GLTE, but prices for that model haven’t been announced yet.